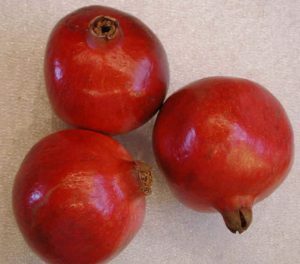 The pomegranate is a thick-skinned several-celled reddish berry that is about the size of an orange. It has sweet/tart, juicy edible seeds. Pomegranates appear to be a seasonal fruit, available as an import in our area only in autumn and winter. We split them open with a knife and have fun picking out the juicy seeds and eating them. See the nutritional chart below.